Spring might not be in the air, but divorce certainly is. (While on deadline, I learned Rudy and Judith Giuliani are divorcing after 15 years of their headline-making marriage) Just this morning actor Channing Tatum and his wife, actress-dancer Jenna Dewan, announced they’ve called it quits after plenty of rumors suggesting that something was amiss in their nine-year marriage. This latest celebrity bust-up rounds out of the trifecta of high-profile splits which started with the not-so-surprising announcement in February that Jennifer Aniston and Justin Theroux were ending their two-year bicoastal union and last month’s news Vanessa Trump was divorcing from Donald Trump, Jr. after twelve years of marriage. 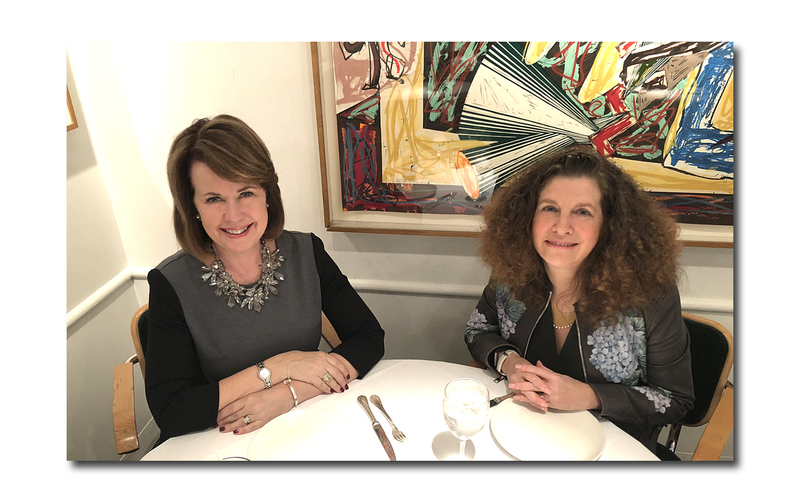 “You can never tell what’s going on in someone else’s marriage,” said this week’s lunch date, Lisa Zeiderman, a Managing Partner of the law firm of Miller Zeiderman & Wiederkehr. Our mutual friend, LAK PR CEO Lisa Linden introduced us in this very dining room (where else?) last month and suggested we might have something to talk about. I’ll say. When I mentioned that would be very difficult to prove, Lisa pointed out that when marriages are very public, certain actions and events that show the marriage went bad at a specific period of time can prove problematic for a celebrity claiming spousal privilege. As anyone who reads Page Six or People magazine knows, a good pre-nup is essential in Hollywood and can include all kinds of stipulations like custody of pets. “They used to be considered personal property,” said Lisa. “But there was decision in New York State Supreme Court where the court found there could be a custody issue regarding animals which challenges the old school rule.” Animal lovers Aniston and Theroux reportedly had to reach a custody agreement involving their four dogs. If I were Aniston, I’d stick to dogs and just date. Seriously. She has seen an increase in the number of people coming in requesting a post-nup which can involve renegotiating the pre-nup or putting a contract in place for the first time setting out the terms of a couple’s marriage after the fact. Common reasons for this include these two all too familiar scenarios: one person is upset over the way their spouse is handling the finances or, after agreeing one spouse would stay home and raise children, the other spouse has decided two incomes are needed. I was surprised to learn the national divorce rate which had been 50 percent for some time, had fallen to between 42 and 45 percent. The reason, said Lisa, is because “People in the lesser income and education groups are not getting married as much.” Hmmm. I thought it was because for a lot of people, it’s too expensive to get divorced. Nope. “If people want to get divorced, they’ll find a way,” she said. Some couples “with no major issues, no alimony and no child support issues” could uncouple for around $15,000. “But those instances are rare for our firm.” Attorneys works off a retainer, she explained, and if the process of getting divorced lasts longer than the retainer, clients are billed for those hours. There are cases, said Lisa, where the spouse who earns appreciably more money than the other spouse can be compelled by the court to pay some of the other spouse’s costs. Lisa told me there is a “guideline formula” for determining alimony in New York State which, for example, may award between two and five years (“the high side”) worth of alimony to a spouse in a case of the dissolution of a 15-year marriage. “There is no redo on alimony.” I was surprised to learn only about five percent of divorce cases go to trial. “A lot of cases get settled the day of the trial” because ultimately couples decide they and their attorneys, not the court, should decide their fates. 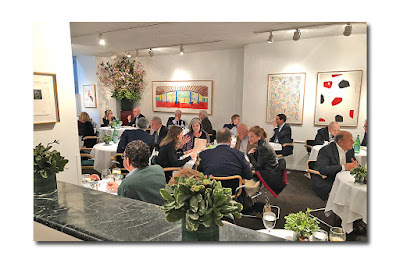 Jimmy Finkelstein on Table One … Peter Brown on Two … Joan Jakobson and pals on Three .. Fire and Fury author Michael Wolff and a blonde gal we didn’t recognize on Four … Allen & Company’s Stan Shuman on Five … Andrew Stein on Six … Book-seller Glenn Horowitz on Seven … and New York Social Diary’s David Patrick Columbia back at his regular perch on Eight …ABC News’ Bob Woodruff on Eleven … Lord Norman Foster on Twelve. I stopped by Table Fourteen to say hello to Dan Abrams and Andrew Ross Sorkin, two guys that give new meaning to the word multi-tasking. Dan, as you may recall is cohosting the new A&E show Grace vs. Abrams with last week’s ‘Lunch’ interview, Nancy Grace. He’s also got another show on A&E, Live PD, is chief legal analyst for ABC News and runs his own media company, Abrams Media Network which includes the buzzworthy news and media website, Mediaite. Andrew is a columnist for The New York Times, a co-anchor of Squawk Box on CNBC and the founder and editor-at-large of DealBook, an online daily financial report published by The Times that he started in 2001. Oh, and he wrote the definitive book on the financial crisis of 2008, Too Big to Fail. You may have seen his name in the credits of Billions which just last week returned to Showtime for its third season. He’s the co-creator of the highly addictive series. I’m obsessed. I had to ask Andrew if more cringe-inducing S&Ms scenes are in the cards having heard from Malin Akerman, who plays Lara Axelrod on the show that the producers decided to all but eliminate them from season two. If you saw the premiere, you know they had a change of heart. “You’d have to ask the writers,” said Andrew. I also mentioned how surprised I was to learn that Toby Leonard Moore, who plays Bryan Connerty, my favorite character and the only decent (so far) guy on the show, wasn’t born and bred here. “He’s Australian,” Andrew told me. You have to watch the show to understand what a surprise that is. Toby is that good. Tune in next Sunday and see for yourself. I caught up with Henry Schleiff, president of Investigation Discovery, after he finished up lunch on Table Fifteen. I caught him as he was running out the door and told him his ears must have been burning last week during my interview with Nancy. Back in the day, Henry ran Court TV which really made stars out of Nancy and Dan Abrams. He is a master showman who threw a great party for Nancy and me when the book we co-authored was published in 2005. See, I’ve told you all roads lead to Michael’s. We’ll be off on a belated Spring Break next week. See you back at Michael’s in two weeks!